The remarkable looking animals to the right are Hooded Nudibranchs (Melibe leonina up to 10 cm). A nudibranch is a type of sea slug that has naked (“nudi”) gills (“branchs”). 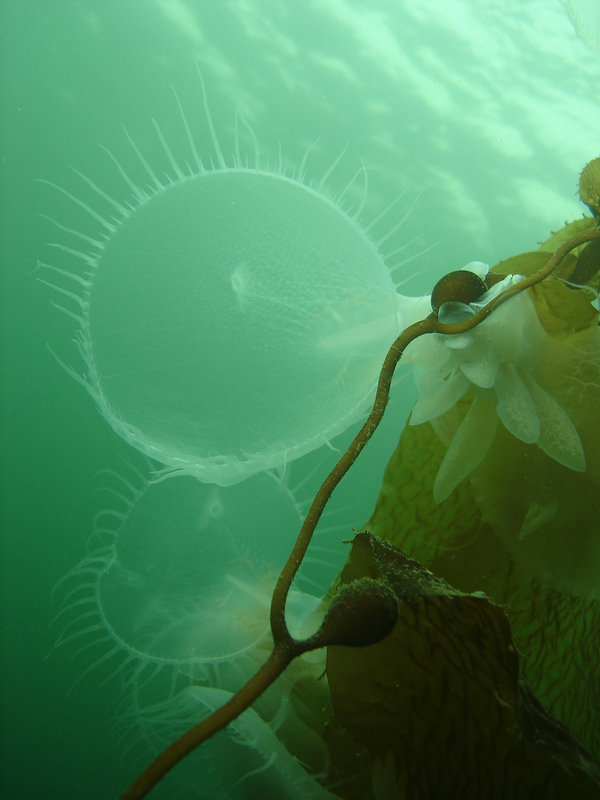 Starting in the fall, around NE Vancouver Island, they come together in order to mate and it is awe-inspiring to see 100s of them clustered together, delicate and ghost-like, clinging to kelp. Often, you can see them swimming on the surface and many people mistake them for jellyfish. It is indeed one of the most alien looking of the 200+ sea slug species of our area. The large disc-like head lets it feed on plankton and small crustaceans and the lobed structures on the animals’ backs are the naked gills. 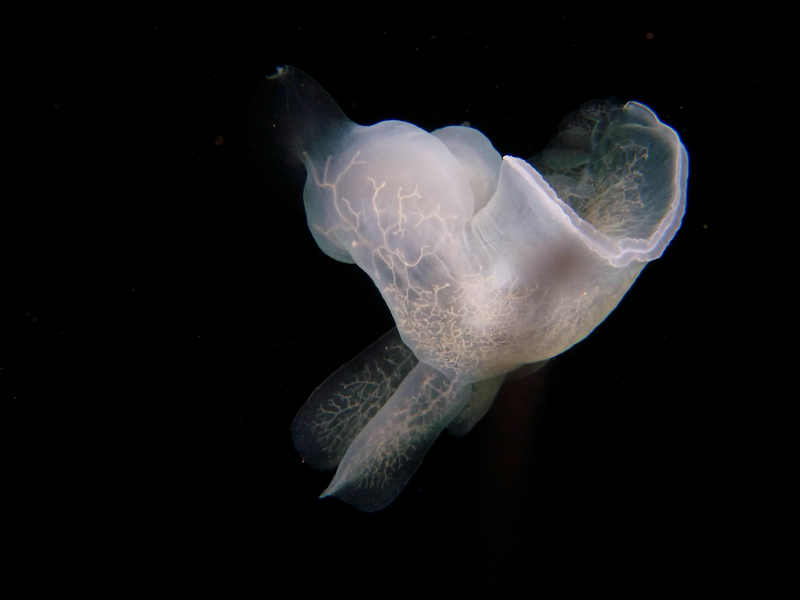 Since sea slugs can only sense light and dark, the way Hooded Nudibranchs signal one another is by emitting a fruity scent (pheromone) that attracts others of their kind. My personal experience after having picked up a dead Hooded Nudibranch on the beach, is that the smell is something like a mix of watermelon and grapefruit and the scent stayed on my hand for more than an hour. After mating, both animals lay eggs (they are hermaphrodites) and then, they die. You can find additional information about why sea slugs are hermaphrodites at this past blog posting. Typically in our area they lay their egg masses between January and April. Each ribbon of eggs is only about one centimetre wide and contains thousands of eggs. Every dot is an egg capsule contains 15 to 25 eggs. After about 10 days, depending on temperature, the eggs will hatch into larvae that will be part of the zooplankton soup of the Ocean. The larva are called “veligers” and look very different from the adult Hooded Nudibranchs. They have a shell and a big flap on their head with which they swim and feed on smaller plankton. After 1 to 2 months, they settle to the ocean bottom and change body shape and even digestive tract to become small Hooded Nudibranchs. A few of my video clips of this species below. I love people who love nudibranchs! One of the mysteries on which I spend the most of my time is trying to match nudibranchs with their eggs. Took me several years to know for sure these were the eggs of the hooded. Lots more nudibranch love to come on this blog! so gorgeous Jackie… can’t wait for more! My wonderful dive buddy – so many of these shots/opportunities are possible because of our diving together and sharing the passion for it all. The pictures and videos of nudibranches! So great to know you like nudibranchs!!! If everyone knew about them and cared, I think the world would be a better place! That is so neat! I was actually really amazed and shocked to hear that they produce phereomones that actually smell like fruit. Very remarkable! 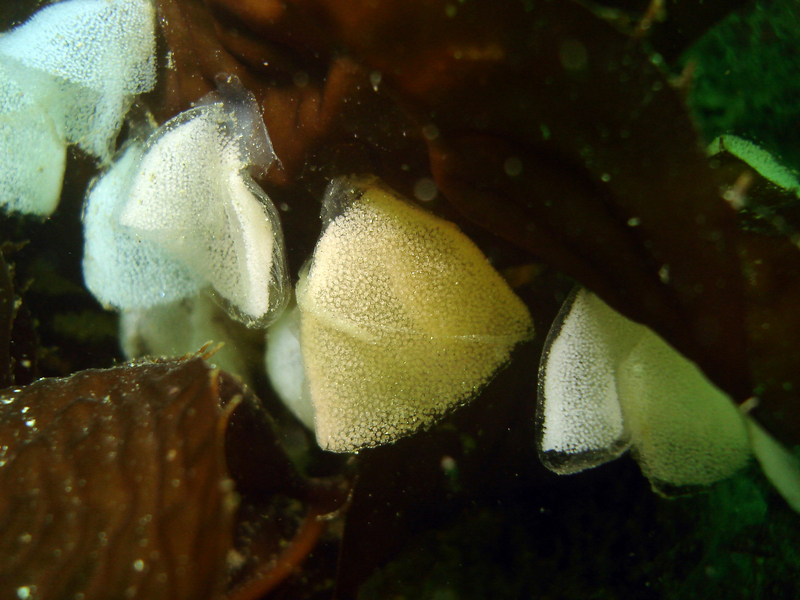 – Just a side thought, I wonder if there are any studies out there that have determined how similar in composition the phereomones of the hooded nudibranchs actually is to the compounds that are produced by plants in their fruits, would be interesting to find out! Thank you for sharing your knowledge Jackie & your beautiful pictures! I look forward to each new entry you add to your site! Picked up a hooded nudibranch from a beach on Flores Island today and put him in a safe spot in the water. He was alive and swam off – I found my hand smelt like a mix of fruit and pine, and now, nearly 2 hours later, smells like watermelon! Very interesting! Thank you so much for this Marcie! Love your very accurate description of the smell as “a mix of fruit and pine”. It is just astounding isn’t it how long the smell persists? Don’t think anyone is quite the same after having smelled the pheromones of hooded nudibranchs – stirs such a sense of awe.